Back in November of last year, Google announced a new invite-only project called Contributor that was an “experiment in additional ways to fund the web.” The basics are this – Google Contributor gives you the opportunity to experience less ads when browsing your favorite websites by contributing a set amount of money each month, money that is distributed to those sites. You get less ads and your favorite websites get money that should help them continue making great content. Today, Google began sending out a whole bunch of invites to interested parties. We received an invite and thought we would show you how this new ad-light world might look. Again, Contributor is an invite-only service as of right now, so if you are interested in signing up, head over to the Contributor site and let Google know. So how does it all work and how much does it cost? As I just mentioned, you need to be invited. Once you are invited, you get to accept that invite and then decide how much money you want to contribute each month. When Google first introduced Contributor, they were asking that you pay in the range of $1-$3 per month, but now that more invites are out and more websites are participating, the pricing scheme has changed. 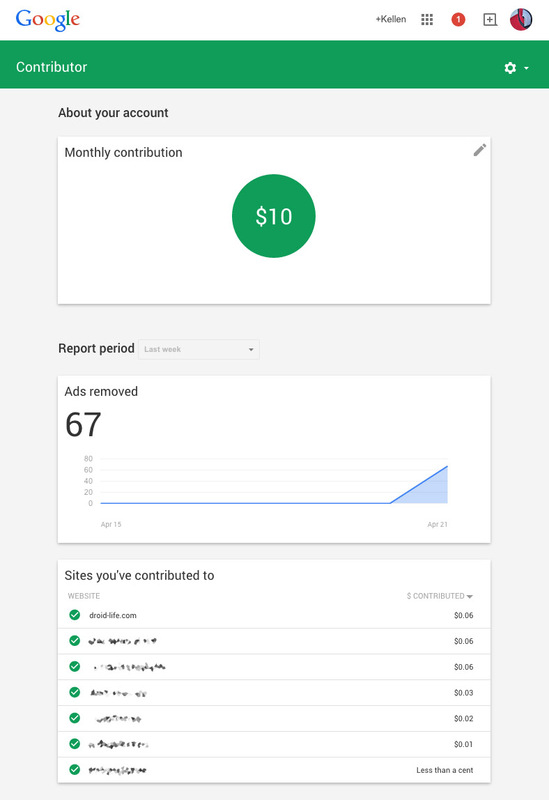 Google is now asking that you pay anywhere from $1 to $15 per month, but they are recommending you get in $2, $5, or $10 contribution slots. The more you pay, the less ads you will see. Once you decide on an amount, you setup a payment through Google Wallet. Then, you are ready to start browsing the web and experiencing less ads, as long as you are signed into your Google account. You will notice I keep saying “less” instead of “ad-free.” Contributor isn’t an ad-free service, it just allows you to reduce the number of ads you see, which again, can be seen in the images above. With a payment selected, you now get to enter the simple Contributor dashboard to tweak a few settings and keep track of everything. There are two pages in the dashboard, one that shows your contribution, number of ads removed, and the sites (with amounts) you have contributed to, and the other has a couple of settings for things like specifying the sites you want to contribute to and what you would like to replace ads with. That’s it. This dashboard is incredibly simple. You can click on the contribution amount and then change it to whatever number you want from $1 to $15 at any time. Clicking on it takes you to the GIF I used above. The “Ads removed” and “Sites you’ve contributed to” sections aren’t all that interactive, but if you see sites in your “contributed to” section that you would rather not give money to, you can click them and tell Contributor to stop using the service there. 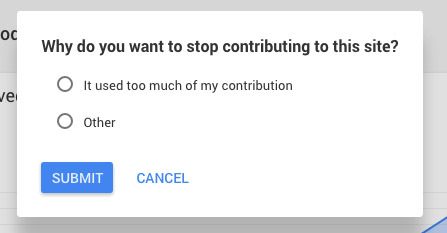 You also get to tell Contributor why, though the options are only “It used too much of my contribution” and “Other” at this time. On the Settings page, you can tell Contributor to spread your monthly contribution throughout all of the participating sites or specify individual sites that you would rather support. You also get to tell it what you would like to see in the spots that ads would typically be shown. As you can see from the images below, I chose to see cats. Yes, I did. What does it look like on websites? 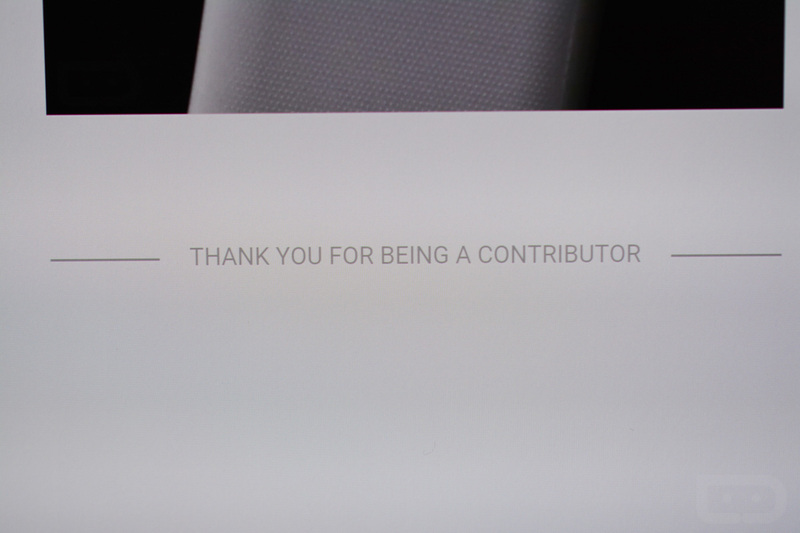 Ahh yes, you probably want to know what the actual Contributor experience is like. Well, like this. 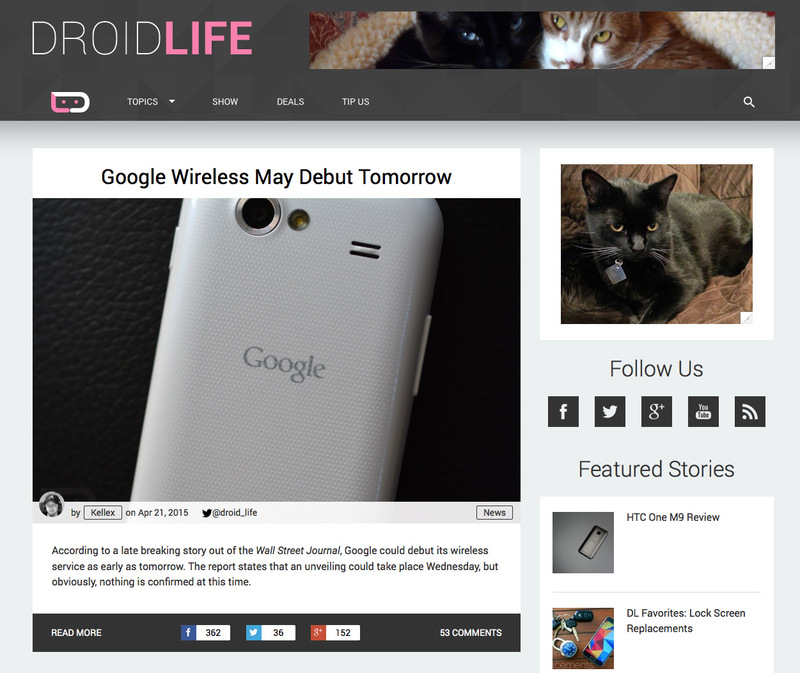 Look at those adorable cats in place of the ads that would normally show on Droid Life. What about mobile, you ask? 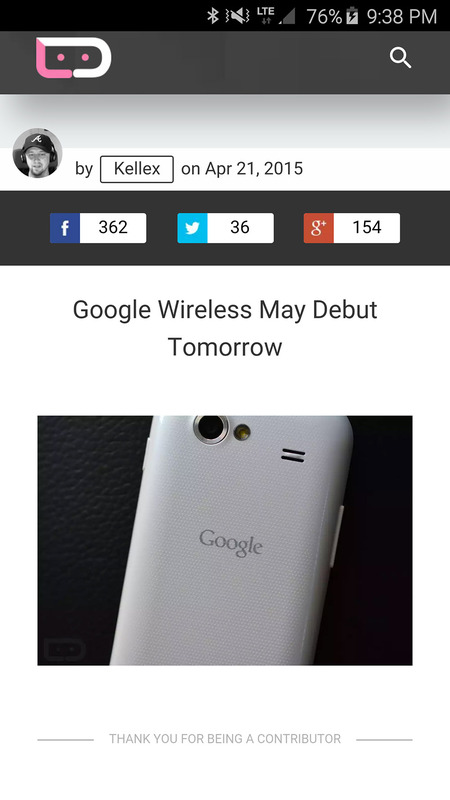 Mobile works too, as long as you are signed into Chrome. Check it out. 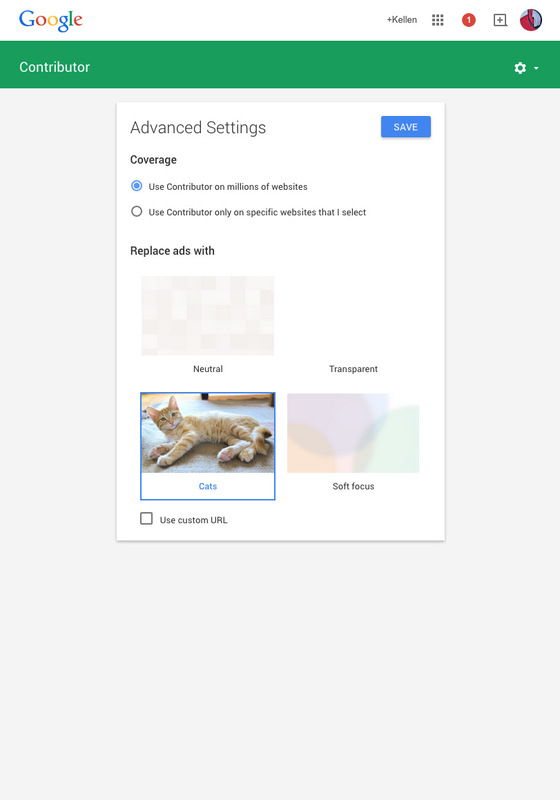 Instead of the cats, Google simple replaced a banner under our lead image with a “THANK YOU FOR BEING A CONTRIBUTOR” comment. It’s a clean look, and probably better than me staring at cats every time I load a web page. What happens to my contribution each month? If you don’t spend your monthly contribution, it rolls over to the next month. OK, so which sites are participating? 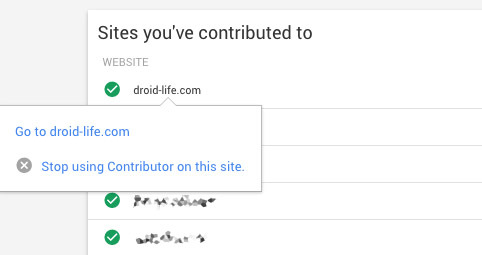 Google claims that millions of sites are now a part of Contributor. What that really means is that Google is automatically adding in sites that use their ad services, like Ad Exchange and Adsense. I don’t know how I feel about that, but my Contributor account seems to work on just about every website I visit, because most websites use at least one of Google’s ad products. Google’s FAQ does say specifically that Contributor works on websites “that show Google ads.” So yeah, if a website is showing any form of Google ads, Contributor will work on it unless they manually tell it not to. So in short, if you sign up for Contributor, expect it to work on most websites. It is kind of awesome. Right now, I’m paying $10 per month and am already seeing a lot less ads. Of course, we all know that ad-block is free, but to website owners like me, ad-block is a pretty horrible product that only hurts our opportunity to keep producing content that is free to consume. I personally, am now enjoying the fact that ads in my browser are reduced on the sites I visit regularly, except I’m doing it while still helping these sites. It’ll be interesting to see how this all affects the way we use the internet, if people are willing to pay to support their favorite sites, and if sites like ours can actually make any money as more people sign-up. Anyone else get an invite to Contributor? What do you think?